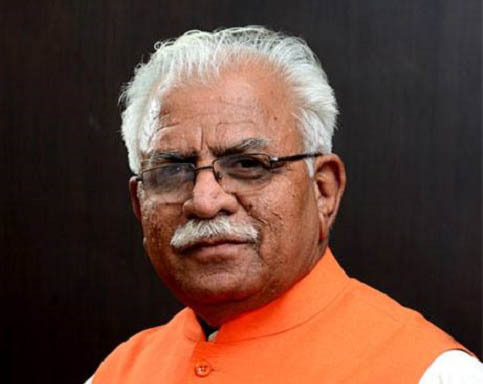 Chandigarh, August 4 – All the workers of Haryana unit of the BJP can now get information pertaining to the schemes and programmes of Central and State governments as well as activities of the organization on their mobile phones a special digital app has been prepared by the party. This was informed by the Chief Minister Mr Manohar Lal after launching an app in Digital BJP Programme organized during the training camp of State unit of the Party representatives at Surajkund in Faridabad today. Incharge of Haryana BJP affairs Dr Anil Jain and State BJP President Mr Subhash Barala were also present on this occasion. In furtherance of the Digital India Programme of the Prime Minister Mr Narendra Modi, the Chief Minister said that he would make direct communication with all district offices of the party on August 16. The BJP offices at Rohtak, Panchkula and Chandigarh already have the facilities of video conferencing and the remaining officers would be connected with this facility. While he would remain present on August 16 at his residence, State BJP President and Incharge party affairs would remain present at Panchkula and Rohtak party offices respectively. District President and other members of party would be present at all district headquarters. Giving information about positive changes that occured as a result of pushing IT in works of State government, he said that digital India was also a topic in the meeting of Inter-state Council held recently in New Delhi. Three of the seven examples in this topic were from Haryana alone. With the usage of e-services and having made Aadhaar compulsory, the state has saved nearly Rs five crore annually. With the usage of e-services in PDS system, five lakh such beneficiaries were identified which were enjoying the subsidy of kerosene alongwith LPG. By eliminating these ration cards, the state have saved Rs 150 crore whicgh used to be given as annual subsidy on kerosene and two per cent increase has been recorded in sale of petrol and diesel. Similarly, two lakh fake beneficiaries of pension schemes were detected in the state and 40 per cent saving was recorded by identifying fake beneficiaries of scholarship schemes. He said that the use of IT tools helps in work readiness and increases efficiency. He said that National Land Records Management Program is being prepared to settle the land dispute. With this, every inch of ground data will be available online. Similarly, Special database of all 2.5 crore citizens is also being prepared in the state to have the online information about all its citizens. He also congratulated Central Convener of BJP IT Cell Mr Arvind Gupta and Convener of Haryana Unit Mr Vikram Gaur for making the Haryana’s BJP unit first digital unit in the country. He called upon the workers to apprise the masses about Goods and Services Tax Bill which has been passed by the Parliament. The Bill will reduce the unnecessary taxes and inflation. He said that form ‘C’ would be available online for relief to traders. Others present on the occasion included Urban Local Bodies Minister Mrs Kavita Jain, Transport Minister Mr Krishan Lal Panwar, Industries Minister Mr Vipul Goel, Minister of Cooperation Mr Manish Grover, Minister of State for Public Health Engineering Dr Banwari Lal, Minister of State for Labour and Employment Mr Nayab Singh Saini, Chief Parliamentary Secretaries Mr Shyam Singh Rana, Mr Bakhshish Singh Virk, Seema Trikha and other leaders of party.